You can grant an employee full access to your account by making them an Administrator. Click on the User who you want to make an administrator. Click on the toggle button called Administrator under the User Details section and hit Update Details. Administrators will be able to manage all the tasks listed under Permissions. To grant access to only certain parts of your phone system to a User, select from the Permissions drop down list on the User Details page. Click on the User who you want to give Permissions to. Select the Permissions in the drop down menu under the User Details section and hit Update Details. 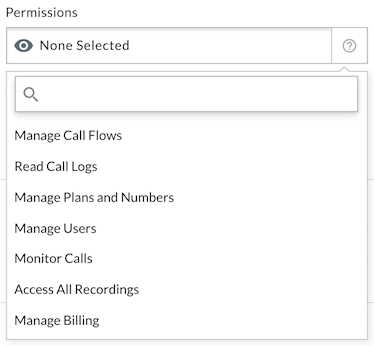 Manage Call Flows – User can add, delete, and edit Call Flows. Read Call Logs – User can access and download Call Logs for all your phone numbers. Manage Plans and Numbers – User can add, edit, and delete any of your plans and phone numbers. Manage Users – User can add, edit, and delete other Users on your system. Monitor Calls – User can monitor live calls of other Users. Access All Recordings – User can access all call recordings of other Users in addition to their own. Manage Billing – User can add, edit, and delete your payment source and auto-recharge status.